“Lucknow is known as a city of dreams, and 160 years after the elegant court of Nawab Wajid Ali Shah, there are almost as many different ways of interpreting it, as there were dreamers”, such goes the blurb of this splendid book about Lucknow’s heritage and cultural charm by Vipul B. Varshney, published in a beautiful hard bound volume by Niyogi books. Indeed, such is the allure of Lucknow that shayars have written amazing couplets about its beauty and grandeur, and authors have penned glorious books in its honour. This book, which has been supported by INTACH (Indian National Trust for Art and Cultural Heritage) takes one into the various parts of Lucknow- Hussainabad, Aminabad, The Residency, Alambagh, Charbagh, Kaiserbag, Hazratganj; and the various monuments that so characterise Lucknow- The Bada Imambara, Chhota Imambara, Tille Wali Masjid, Rumi Darwaza- to name a few, to make one live the magic of its past again. Through this coffee table book, one partakes on a journey of the bygone era, exploring the aesthetics of the people of Awadh, by detailing about their monuments with their interesting back stories. The pictures of the monuments are very spectacular, with some being panoramic and some showing in-depth perspectives. Various architectural drawings also accompany the pictures. The intricate detailing of the structures also speaks about the melodious music, the ethereal dances, the exquisite crafts, and the exotic cuisine, which are all part of the intrinsic Lucknow lifestyle. 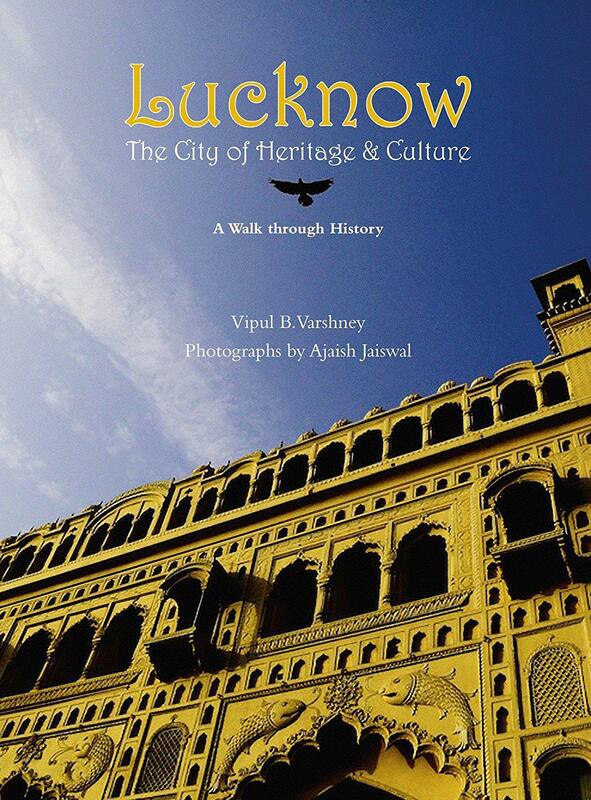 This is a book that offers a virtual tour of Lucknow for armchair travellers; acts as a guide for tourists who want to foray into the labyrinthine lanes and beaming alleys of “The City of Nawabs”; is an architectural delight for enthusiasts of historical buildings and Indo-Saracenic style architecture; takes one on “A walk through history” (as the book is suitably sub-titled) through its marvellous pictures, historical tidbits and factual and verbal information about the heritage monuments; and also makes one acquainted with the cultural quotient of this “City of Tehzeeb” by detailing about its elegant chikankari, mouth-watering cuisine and mesmerising music and dance forms. The book celebrates the all-encompassing quintessence of a city which is an exquisite fusion of the past with the present, of an era bygone and the way forward, of different religions and cultures- a perfect example of Hindustani brotherhood, inclusivity and ethos.